How to pick one Clientele single above all the others? They might have had four or five entries in my chart of 45 45s. Which should I go for, from my shortlist? ‘What goes up’ perhaps, because it was their first, and mine, and could consider itself rather harshly done by in being left off the UK version of the Suburban light compilation? ‘(I want you) More than ever’ for being one of the best of their strand of supremely melodic, yearning pop songs? ‘(I can’t seem to) make you mine’ because a lovely song is made lovelier through the sharing of the vocals with Pam Berry, whose mahogany tones contrast perfectly with the ivy-bedecked oak of Alasdair’s voice? Or ‘Lacewings’, with its mind-bending slide guitar, iridescence and smoke-hazed lyrical high? 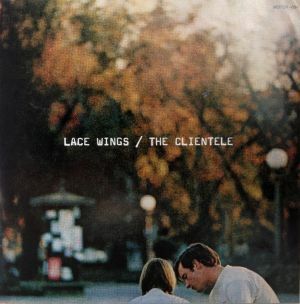 The last of these, I think, because the approach the Clientele took on ‘Lacewings’ underpins why I and many others like them so much – melodic spontaneity coupled with a gift for timeless or transcendent music, set against words which while being kite-high (or in other cases, lead balloon-low) anchor the group in a specific time and place. These have a lacewing tenderness which make them particularly special. Admiration doesn’t lessen to know that Alasdair’s slide guitar part – to my ears taking its cue from the playing on Television’s ‘Little Johnny Jewel’ – was improvised at the point of recording the song, and done in one take. It’s quite something to have bottled those moments of translucent invention so immediately, and for all time. Looking forward to the new album, next month.